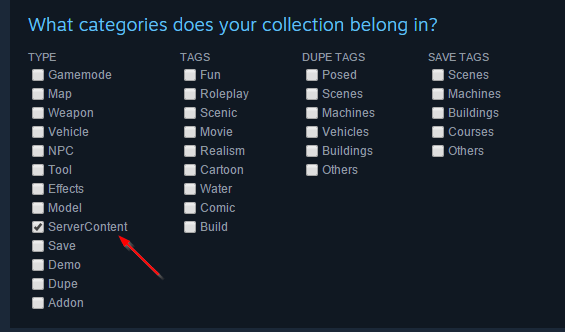 This tutorial will show you how to create a Steam Workshop collection. This can either be done in Steam client or at https://steamcommunity.com/ in your favorite browser. 1. At the top menu click on Community then Workshop. 2. 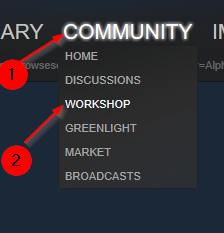 Now in the Search for a Workshop search box type in the game you want to create this Workshop for. In our case we will create it for Garry's Mod. Once you find the game you want click the search button. 3. Now click on Browse and then Collections. 4. Now click on the Create Collection button. After clicking the button you will be able to name your collection and add a description of it as well. For categories you can set it to Server Content. 5. Once you have filled everything out click the Save and Continue button. 6. 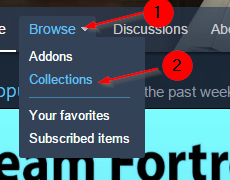 One the next page you will be able to add items to your collection either from items you published yourself, items you added to your favorites, or items you have subscribed to. So be sure to first add items to your favorites or subscribe to them so you can add them at this step. Once you have added everything you wanted click the Save and Continue button. 7. Now click the Public button to public your new Workshop collection. 8. Now make sure that the Workshop's visibility has been set to Public. That's it you're all set! Now whenever you need to add a Workshop collection to the server you can do it using the Workshop Collection's ID number which you can find at the end of the URL for it. So if the URL is http://steamcommunity.com/workshop/workshoplegalagreement/?appid=4000&originpublishedfileid=659355715# the ID would be 659355715.